Well, for every aspiring marathon runner out there, here’s a free lesson in what not to do. After achieving her lifelong goal of qualifying for the U.S. women’s Olympic team, marathoner Molly Roberts was on top of the world. But any dreams she had of capturing Olympic gold came to a sobering end in Rio when, convinced she had it in the bag, Molly decided to run the entire race with her arms in the air. Upon hearing the starting pistol, Molly bolted out of the gate and accelerated into an early lead with both arms in the air in proud celebration. Just one mile in, she’d fallen well out of the top 50, arms still extended in jubilation. Her arms remained up the rest of the way, despite her slipping farther behind with each passing kilometer. When she finally crossed the finish line, she instantly realized her mistake. Indeed, it did. The tears, the fist pumps, the pointing to the sky—at times it looked as if Molly was doing everything in her power to tempt fate. Just steps into the 26.2-mile course, Molly appeared to deliberately slow her pace to salute an American flag and wipe tears of joy out of her eyes as other runners zipped by, two hours of racing still ahead of them. 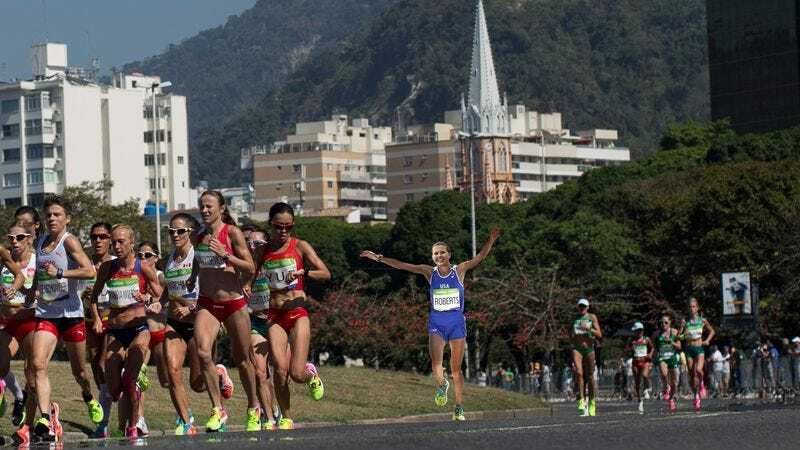 After her disappointing Olympic result, Molly is the first to admit that her decision to showboat the entire marathon was the reason for finishing nowhere near the medal stand. Hopefully, she has learned her lesson from Rio and will wait to throw her arms up in celebration until after the race is over from now on. Unfortunately for Molly, it’s going to be four long years until she can put that wisdom to the test.